Musculoskeletal disorders constitute a major public health problem with osteoporosis and osteoarthritis (the most common metabolic and joint disorders respectively) account for 6.8% of total disability; the cost associated with these conditions accounts for 3% of gross national product each year. The annual cost to the NHS of managing osteoporotic fractures is £3.3bn with over half of this figure attributable to hip fracture. Our group has studied the epidemiology of osteoporosis across the life course since 1985. 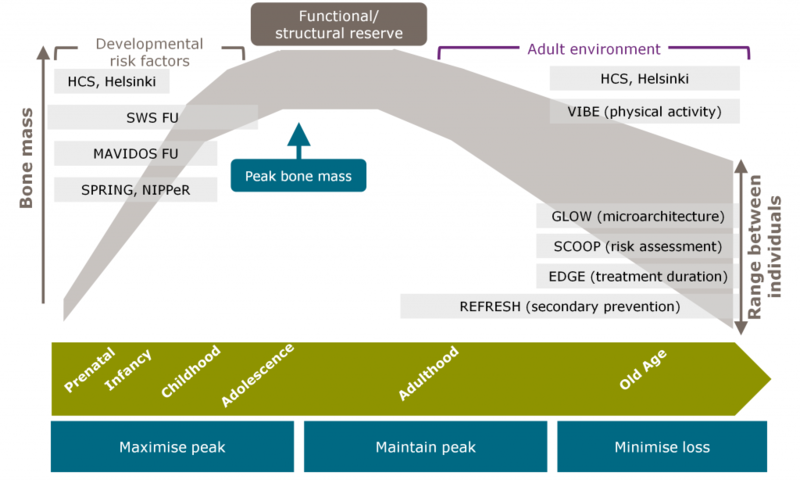 Over the last decade we have demonstrated that the risk of osteoporosis is accrued across the entire life course, even from conception, documenting that poor early growth is associated with reduced adult bone mass and increased risk of fracture. These observations led us to characterise, in mother/offspring cohorts associations between maternal diet, lifestyle, physical activity, and in particular 25(OH)D status during pregnancy and offspring bone mass and body composition. These findings have directly informed the MAVIDOS (Maternal Vitamin D Osteoporosis Study) the first randomised controlled trial of vitamin D supplementation in pregnancy for optimisation of offspring bone mass. The objective of this programme is to firstly understand better the mechanisms which underlie the developmental origins of osteoporosis and other musculoskeletal disorders, and secondly to develop intervention studies aimed at modifying later disease risk through nutritional and other interventions targeted at critical periods of early development.